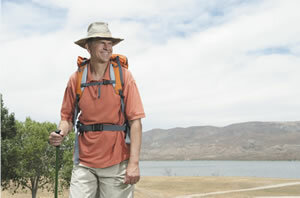 Cut down on risky sun exposure by wearing a wide brimmed hat while outdoors. Reducing your sun exposure and performing periodic skin checks are the key steps. Melanoma is less common than other major types of skin cancer but it's the most dangerous. More men die of melanoma than women. In part this is because men are less conscious of their skin appearance and therefore may be more likely to dismiss blemishes as harmless "liver spots" or neglect to tell their doctors about a new or changing mole. That's unfortunate, because if caught in time melanoma's dangerous spread to other parts of the body can be prevented. Fortunately, your skin is the only body organ that is completely open to inspection without fancy medical scans or tests, so it's relatively easy to spot worrying blemishes. You can also reduce your overall risk of cancer by protecting your skin from excessive sun exposure. "Melanoma is on the rise," says Dr. Daniela Kroshinsky, a dermatologist at Harvard-affiliated Massachusetts General Hospital. "We really advocate that people take sun-protective measures and notify their doctors of any concerning or changing spots on their bodies." Melanoma is one of three major types of skin cancer. The other two are squamous cell carcinoma and basal cell carcinoma. Although these cancers are less risky than melanoma overall, they also should be identified and removed. uncontrollably and can invade other parts of the body. The main risk factors for melanoma are age and sun exposure—especially sunburns that blister the skin. That's why it's so important to minimize additional sun exposure as you get older with appropriate clothing. That includes wearing a hat. "Using sunscreen, preventing additional burns, and keeping covered in areas that are chronically exposed really can make a difference," Dr. Kroshinsky says. Factors that raise the risk of skin cancer are light skin, a family history of melanoma, a tendency to develop moles or abnormally-appearing moles, and previous bad sunburns. But people with darker skin types can still get skin cancer, and as a group they are more likely to be diagnosed with advanced-stage melanoma. "They may not monitor their skin as closely because they don't think they are at risk," Dr. Kroshinsky says. "No matter what your skin type, it's very important to seek medical attention for any new or changing lesion or nonhealing skin wound. No one is immune." distinguish between them," Dr. Kroshinsky says. "Getting a professional opinion can really help." Most importantly, keep an eye on your own skin. Ask your spouse, partner, or a family member to take a look at your back and other areas you can't see yourself, like your buttocks, the backs of your thighs, your scalp, and the backs of your ears. "Look for anything that is new or that looks different from other things on your body, or anything that's changing, growing, or bleeding," Dr. Kroshinsky says. "Also, pay attention to any new scabs or wounds that don't heal in a week or two." Your primary care doctor or a dermatologist can be part of the equation too, especially if you have a tendency to develop moles. For people at average risk, a professional check every one to two years might be sufficient. Those with previous skin cancer or a strong family history of it might need to be checked more often. Certain moles are more likely to be melanomas. Use the ABCDE of malignant melanoma to guide your self-exams. A Asymmetry: One half of a mole does not match the other half. B Border irregularity: The edges are ragged, notched, or blurred. C Color: The pigmentation is not uniform; the coloring may include different shades of tan, brown, or black; dashes of red, white, or blue can add to the mottled appearance. D Diameter: Melanomas usually are greater than ¼ inch (6 mm) in diameter, or about the width of a pencil eraser, when diagnosed, but they can be smaller. E Evolving: The mole or skin lesion looks different from the others; is changing in size, shape, or color; or begins to itch, hurt, or bleed.